Life is back to busy. After the freezing cold everything stops for days and no one goes anywhere, not even outside for more than 10 minutes or your face will freeze off kind of week we had, life is back to normal. Tim and I are high-fiving as we pass each other to take a different kid to practice or a game. Homework must be done. Laundry has to be done (okay yeah, I know that should have never stopped, but if the world stops because of a storm, than I stop doing laundry because, well, just because!). Yup, our snow man packs heat. 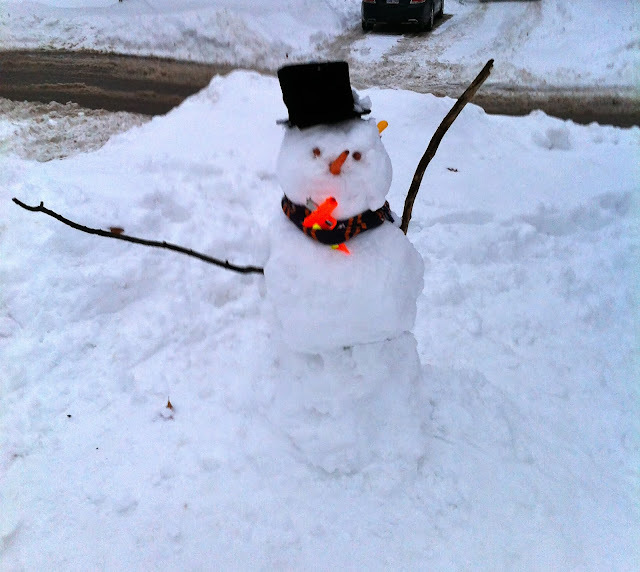 Would you expect anything less from my children and their snowman? We are all having a little bit of trouble getting back into the groove (not to mention finding any clean clothes to wear, taking a few days off from laundry spells disaster around here). Maybe me the most. Waaaa. I miss the slow pace, the low expectations, the hours and hours of play. But routines are good. I know this. Right? And I will get back into a routine, I will. Just in time for the kids to have a long weekend for Martin Luther King day next Monday. I'm not complaining, I'm seriously looking forward to it. Even when the kids finally went back to school at the end of last week, we still had that playful vibe. Tim, Peyton, Wade and I greeted the other two with a snowball fight as they got off the bus. Nothing says welcome home like a snowball in the face. Instead I'm still in love with last week's. Do you sense a theme? Yeah, I can't let go of my dreamy, hang out together all the time last week. I'll move on, but I'll always have my gorgeous Dixie Cup Lights from last week. For real, isn't this dreamy? 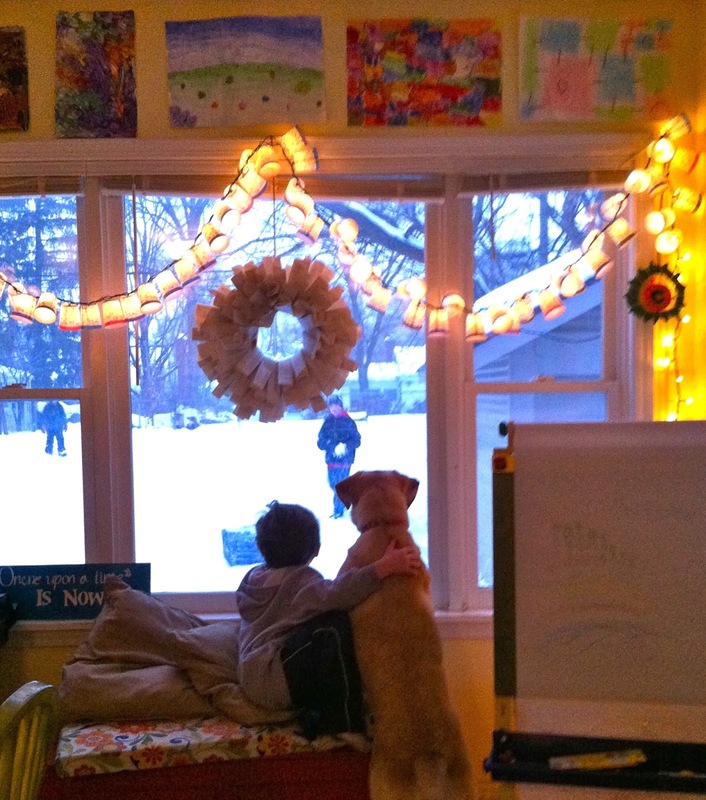 My Dixie Cup lights, my big kids playing in the back yard and my baby snuggling my dog. Makes my heart swell. My kids are obsessed with chess right now. I have lots of fun planned for my Pinterest Poser in the next few months....I want to learn to sew, so that's fun; I want to make a marquee sign because why not, I want to make Nutella hot cocoa because of course, I need/want to make curtains out of bed sheets and make gluten free dinners in the crock pot for a week. Big plans, people. But this week, I'm a total poser. Stuck in the past, wishing we could just lay around in our PJ's worrying about our faces freezing off. But next week? Oh boy, watch out for next week. Have you made anything from Pinterest lately? Share what worked and what didn't, leave a comment here or on my Facebook page. If you are like every store in the world you have so moved onto Valentine's Day. 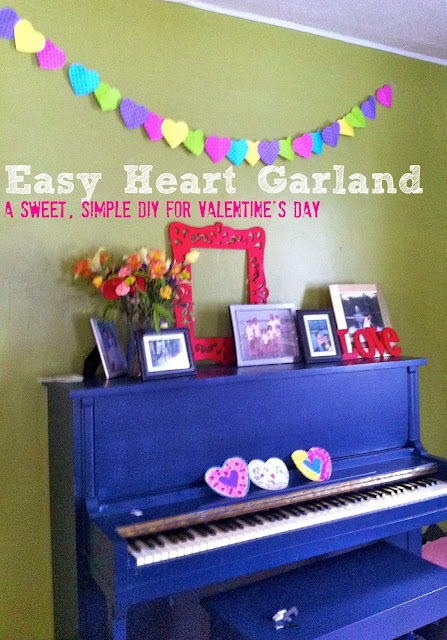 Here's a simple Pinterest-inspired project from last year that I love. Click here for the how-to specifics. Omg, the snowman packing heat slays me and yes, I'm a bit stuck in the slowness of that week, too! 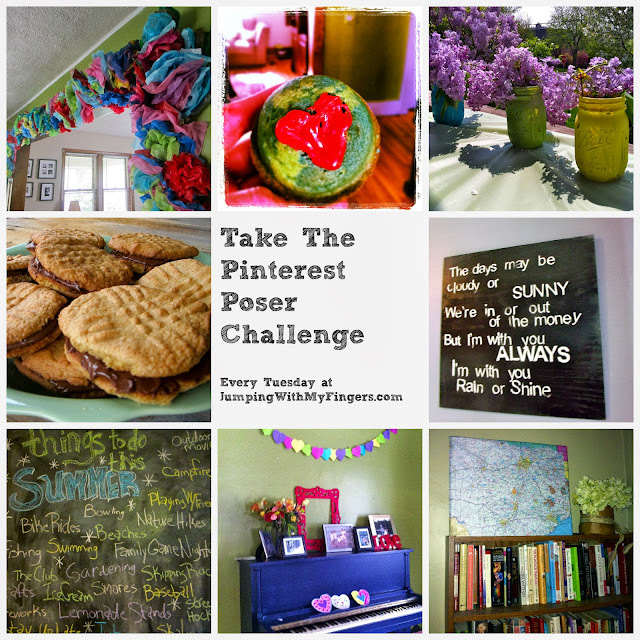 INot Pinteresting this week doesn't make you a poser!